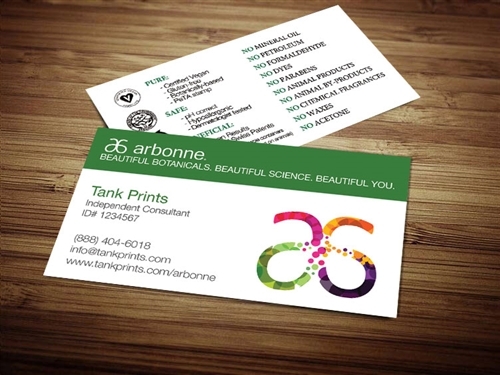 12 Amazing Arbonne Business Cards | Tank Prints - Delivered in 5 business days or less! Prices start at $39.99 for 250 high quality cards. Delivered in 5 business days or less! 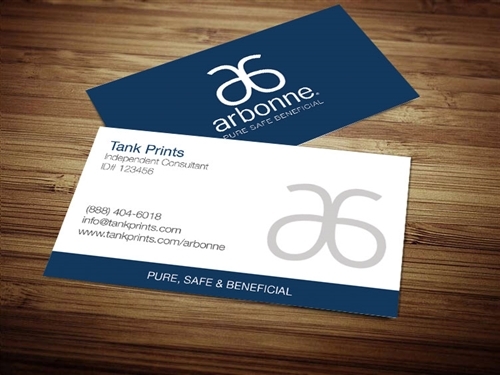 You may not be aware just how much purchasing Arbonne cards can change things for you from Tank Prints. Luckily we're here to give you an idea; seven ideas, in fact! There are many essential cosmetic consultants out there, and it's a competitive business. 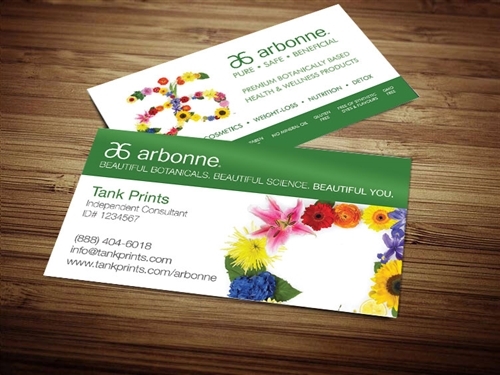 Tank Prints offers many colorful, beautiful Arbonne designs that will help you stand out and be remembered. Customers like to know they’re spending their money with real professionals. Flimsy business cards that have been printed out from a home printer just won’t cut it. 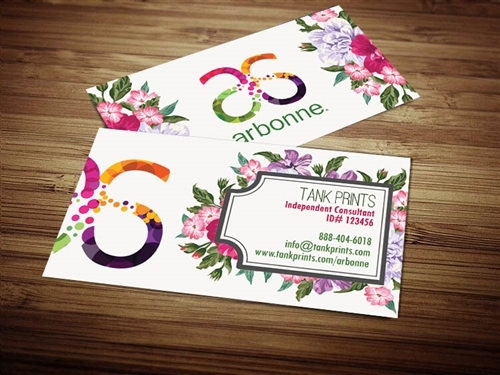 The thick 16-point premium cardstock of our Arbonne business cards will surely impress your customers and establish you as a serious professional. Customers will hold on to well-designed, high-quality business cards. This means that when they're ready to restock their favorite cosmetics, they'll have your contact information readily available to place that new order. Give your customers more than one business card. When customers are satisfied with the product and with you, they'll pass your professional-looking cards on to friends and family and bring you more business. Nothing is more effective at making new business and client contacts than leaving business cards with potential leads. People may be impressed with your charming personality and amazing products, but if they don’t have a way to contact you, they can’t bring you any business. 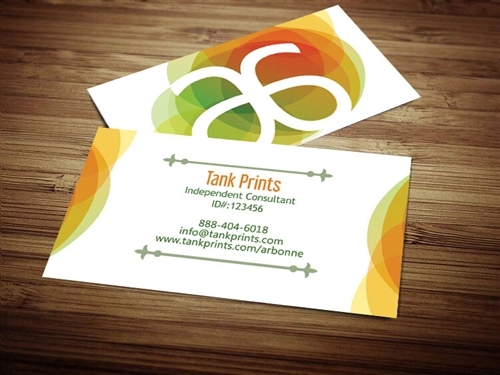 A business card means entrusting your personal contact information to your clients. Knowing they can reach you if they have any questions or concerns about their purchase establishes trust and customer loyalty. 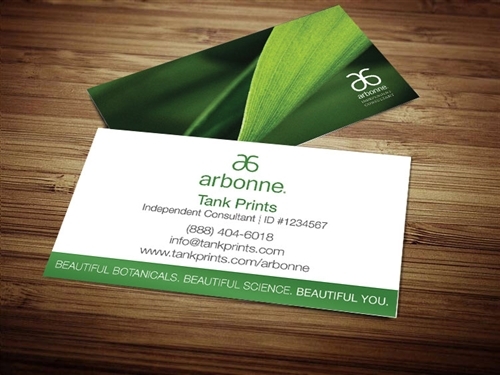 As an Arbonne Independent Consultant, you’re not just selling cosmetics; you’re selling yourself. 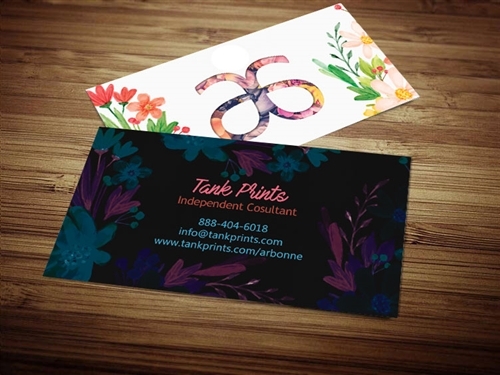 Having beautiful, vibrant, professional business cards will give you the boost of confidence you need to present your best self and close the deal. Choose and customize your favorite card design today and get started in your Arbonne business!